This weekend I was busy making kokeshi doll ornaments for my daughter's nursery class. Each child is supposed to bring something to give to the other children. I decided to give ornaments since I've been told no one throws away a Christmas ornament. Do you think this true? Have you ever thrown away Christmas ornament? The only ornaments I've thrown away were broken ones. Curious to hear your thoughts. Directions to make Kokeshi Doll Ornaments here. I also made this gift tag to go with the ornaments. You're welcome to use the image to make tags for yourself. Just right click, copy, save, and print on heavy card stock. OMG cutest painted wooden dolls I've ever seen! Great idea for Christmas! I have only thrown away broken ornaments too. Although not every ornament makes it onto the tree every year. Sometimes we only put up a small pink one if we are traveling during holidays. Today we are getting a real tree. Yippee! I don't always put up every ornament either. Usually I like to have the tree as a specific theme. This year I just let the kids put up whatever they wanted. So needless to say, there's a lot of toy ornaments at the bottom of the tree. Hmm. I don't think I've ever thrown any away but I don't use all of them every year. I rotate, make theme trees, swap with family, etc. These dolls are SO cute. I'll be linking. We don't throw ornaments away in our house until they break. If Annabel got one of those from one of her friends? She'd sleep with it. I have given ornaments to GoodWill, but it's a rare case when that happens. I'd put that ornament on my tree - you can guarantee it! I loved these ornaments last year, and love this year's version even more! SO darling! I love the gift tag too, and will definitely be using it. THANK YOU!!! P.s. thanks for your kokeshi tag download! it is very sweet. The dolls are really cute. I don't think anyone would throw those away. These are unbelievable. 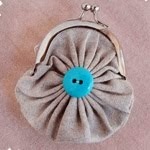 I was coveting similar ones last night on Etsy wishing I had the skills talented folks like you possess. Well done! Very nice..and I am sure yours is the the most unique. I absolutely love your idea! YES YES... people do not throw away ornaments! I've been brainstorming, (with little success til now) on what to give certain people! I really love the ornament and gift tag! I have never thrown an ornament away. Only if mine broke too. They are too precious! I love yours thanks for sharing. 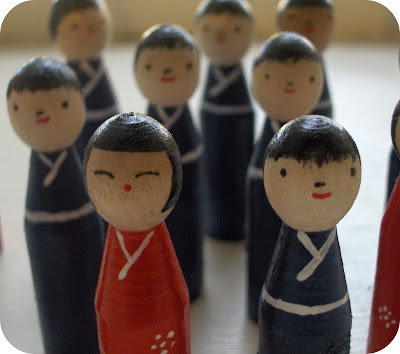 Love these kokeshi dolls...great as ornaments or just on their own, too. 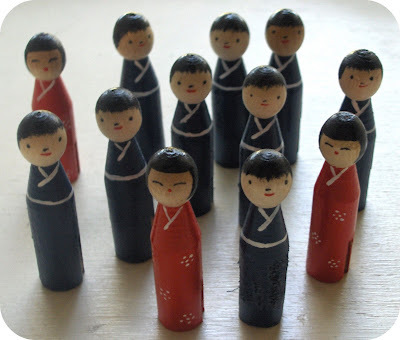 We have a kokeshi doll collection from living in Japan so it would be fun to add some mini ones of our own design! Funny you should ask. I tried to throw away a few old nasty cheap plastic ones, but I couldn't bring myself to do it! So I still have them, in a box, in the basement. But I also have several broken ones that I can't bear to part with. Thanks! This is so cute! 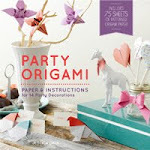 I'd love to match this with an origami set I'm giving my friend. I'm printing it out already. I've never thrown any away either, but I was grateful to whoever donated 40 vintage glass baubles to our local charity shop, as they came home to stay with me! To echo everyone else again, those dolls are WONDERFUL! Love them! Did you see the Kokeshi Gallery that Beth over at Red Yarn (blogspot) held earlier this year where people made kokesi doll, posted photos to Beth and she hosted them on her blog for 2 weeks - some really cute ones! Thank you for posting the gift tags. Everyone loved them. omgosh these are TOO STINKIN' CUTE! ummm...I throw broken ornaments away. I have my favorites but I feel guilty not using all the others. I'm getting too many though and honestly prefer handmade to store bought so this coming year I am going to go through and 'cull' out those that don't make the cut! HA! I'll donate those to the kid's schools. I just stumbled upon your blog today. Though I am more than 2 months late to make these Christmas ornaments, I'll definitely try to make these Kokeishi dolls cos they are absolutely kawaii! Thank you for sharing your craft ideas. Just finished some similar dolls for our ornament swap. I thought I'd made them up, now I see they're traditional Japanese dolls... How funny! I'm going to use your tag, it is so adorable; thank you for offering it to us. 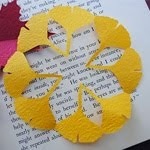 I repair ornaments that get damaged, never discard them. Absolutely gorgeous. I love Kokeshi Dolls. 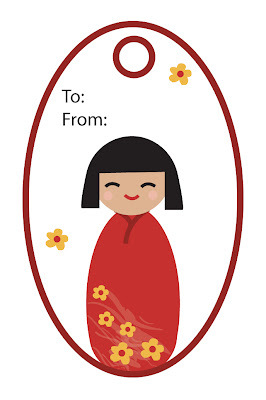 Your tag is perfect for my kokeshi doll bags.